UK: 3 days from purchase order. Europe: 5 days from purchase order. Please take a look at our refunds and returns policy. If you are dissatisfied with your purchase, please contact sales@cloverleafpaintbox.com with your complaint. All prices are displayed without added taxes, UK customers will be charged 20% VAT at the checkout. Payment of these charges and taxes is the responsibility of the recipient and will not be covered by Cloverleaf Paintbox. For further details of charges, please contact your local customs office. 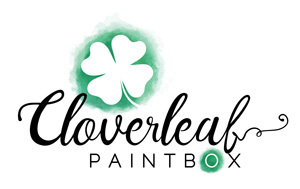 Cloverleaf Paintbox processes all its payments through Paypal. This allows customers the choice of paying with their credit or debit card, or using their Payapl account. Should you have any further questions regarding our products or online ordering, please get in touch with our customer services team, who will be happy to help you.